I thought our CTO +Bryan Crow would either appreciate this geeky joke T-shirt or cringe in embarrassment. I don't know if I can explain it, myself, as I am most definitely not a geek. But as someone who's married to a nerd, can recognize nerdy jokes. Do you love it or hate it? Would you buy this shirt? 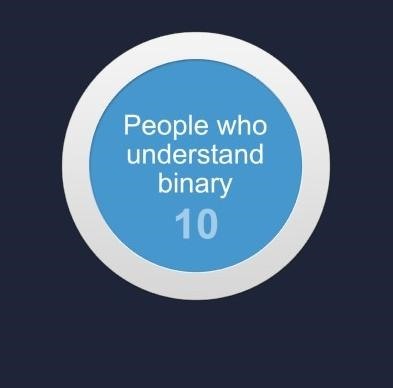 "There are only 10 kinds of people in this world: Those who understand binary, and those who don't". For those who don't get it... 10 in binary = 2 in decimal ("regular numbers").